Skip the queue and enjoy a guided tour of the Royal Palace in Madrid! 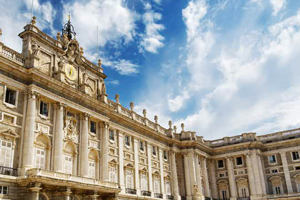 The Tour of Madrid's Royal Palace is an in-depth guided tour of one of the largest royal palaces in Europe. It covers around 135 square metres of luxury, pomp and elegance with rooms, salons, decorated galleries and much more which you will be able to visit in the company of a local guide. A guided tour is always the best solution because it means you'll be able to skip the queues at the entrance and learn in detail and with ease about beautiful places such as this. Being one of the largest and grandest royal palaces in the the world means the Palacio Real boasts an extraordinary collection of art works such as paintings, sculptures, furnishings and grand decor in more than 3,000 rooms which makes having an expert guide at your side a prerequisite for getting the very best out of your visit and enabling you to move around the inside of the building easily and without having to worry about missing out on any of the most beautiful and memorable areas of the palace. Visit the Throne Room, the State Rooms, the Royal Armory, the Yeomans' Salon, the Art Gallery, the kitchen, the pharmacy and much more. Admire panoramic views of Madrid from the upper floors of the palace. The guided tour has been structured in such a way as to provide an in-depth exploration of the Spanish Royal family's official residence during the course of this one and a half hour's visit. The Tour will focus on the magnificent Throne Room at the top of the Main Staircase designed bySabatini and made out of marble, the portrait gallery with works by Caravaggio, Goya and Sorolla, the Royal Pharmacy, (which has retained many items from previous reigns including ceramic containers and prescriptions from a bygone age), and The Armory. Your guide will be able to show you around and provide you with invaluable information which will enable you to fully appreciate the treasures of this spectacular royal residence. In addition to this, at the end of the tour, you will be able to admire stunning views across the city of Madrid from on high as you reach the upper floors of the palace from whence you can enjoy truly breathtaking panoramic views of the Spanish capital. . The history of the palace. The Royal Palace was built in the 18th century on the site of the ancient baroque fortress belonging to the Hapsburgs and was converted into a royal residence which lasted from the reign of Carlos III through the reign of Alfonso XIII. Visiting the Royal Palace will enable you to travel through the history of Spain until the present day even though it is no longer inhabited by the current Spanish royal family. In 1734, a fire destroyed the original building and King Philip V commissioned it to be rebuilt in the form in which it can be seen today. The building's style is very reminiscent of the Parisian style as it was inspired by the drawings which were made by Bernini for the construction of The Louvre. The Palace, official residence of the Spanish monarchy from 1765 until 1931, still manages to hold a relevant position in the every day life of the Spanish crown due to the fact that still today, the state rooms are used for hosting the most fantastic receptions, including the signing of special agreements, banquets and the presentation of their credentials by the foreign ambassadors. Shortly after receipt of payment, you will also receive an email with a coupon attached which you can print off to show at the entrance on the day of your visit.